Here’s one stop that requires your attention. Skyline traffic goes 50-70 mph. At the Silicon Valley Bike Summit, Dave Snyder, Calbike executive director, made a good point while answering a question about the “Idaho stop,” (treat a stop sign as a yield sign) and why there’s no effort to make it the law in California. Snyder said he doesn’t want to go off message. He argues that we need to transform our roads so that cycling is safe and not dwell on running stop signs. Instead, Snyder wants cyclists to work with their local law enforcement to stop enforcing the law. “Use common sense,” Snyder said. The police use their best judgment all the time when they’re out on patrol. He said that the Netherlands police look the other way (and they ride bikes) if someone runs a stop sign in a situation where it’s not hazardous. Netherlands law requires bikes to stop at stop signs in the bike-focused country. From what I can find out about the Idaho law, it was passed way back in 1982. In that year the state did a comprehensive review of traffic regulations. By a stroke of luck, the Administrative Director of the Courts in Idaho, Carl Bianchi, was a cyclist. He wanted to modernize the bicycle law as part of the traffic code revision. He had first-hand experience in dealing with bicycle traffic tickets (a criminal offense!) clogging the courts. Judges didn’t want to have to deal with such petty violations, which pretty much assured that the law would be approved. Some police officers disapproved the law, and even some cyclists. I’ve never been to Idaho, so I can’t comment on how well the law works. 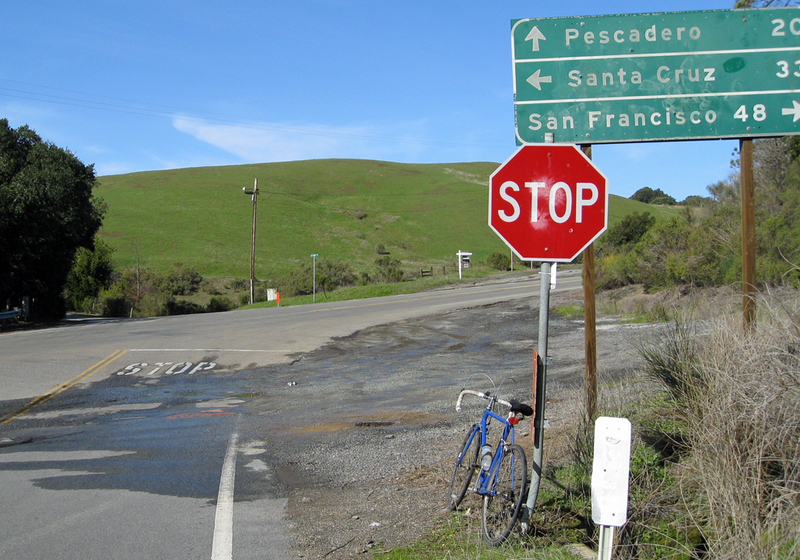 In San Francisco, cyclists recently drove home their argument in favor of the Idaho stop. They stopped at stop signs and immediately snarled traffic. There’s a video with the above link that doesn’t do a good job illustrating the problem. That’s a busy intersection and I can’t imagine anyone riding right through without stopping. I know I wouldn’t. I do the “Idaho stop” all the time, but only when there are no cars around. At busy intersections I always stop, and you should too. Here’s a good video that shows how the Idaho stop law can work. NOTE: According to Wikipedia, Richard Masoner, Scotts Valley author of the Cycleicious blog, coined the term “Idaho stop” as a noun in 2008. This entry was posted on August 19, 2016 at 11:52 am and is filed under News. You can follow any responses to this entry through the RSS 2.0 feed. You can leave a response, or trackback from your own site. Ray: good post but when you write “I do the Idaho stop all the time, but only when there are no cars around,” that’s misleading. You’re doing the Idaho Stop all the time, because the Idaho stop is a full stop when there’s cars around. This is a point so many people choose to overlook. It’s a yield, as it should be, a recognition of human judgement which is already a fundamental part of being on the roads. Dave might be right in the case of auto-maniacal California, where even suggesting that someone’s right to dominate the roads when in a car is going to be tempered is comparable to threatening their right to exist, but we almost got close to a formal recognition of Idaho Stop (for stop signs if not red lights) in San Francisco were it not for the tool Ed Lee’s veto, and if SF can do it, it can happen elsewhere. It’s important that the law align with what is courteous and predictable, and when a law over-reaches as it does in the case of how cyclists are expected to comply with laws designed to deal with the excessive risk of automobile risk, it breeds lack of respect for all of the law. In “auto-maniacal California,” there are already too many vehicles (cars and trucks) making “California stops” and not stopping at all, which puts cyclists and pedestrians at risk. I agree with Dave Snyder’s assessment that changing there California VehicleCode to add the “Idaho Stop” would be a huge–and probably unsuccessful–waste of political capital for the cycling community. This is especially important to remember when we have so many other higher-priority needs like maintaining funding levels for bike infrastructure, increasing educational offerings to cyclists and motorists about our proper place on the roadway, and better training for law enforcement officers who cite cyclists improperly. Uh, I didn’t know about that Wikipedia etymology. I find a mention of “Idaho Stop Law” in an email from Jim Stallman, who serves on the Saratoga BPAC, back in May of 2007, so there’s at least one use that predates my own in 2008. Thanks for the shoutout nonetheless. Interesting, I didn’t realize my place in history 🙂 I think I picked up “Idaho Stop Law” from Jim Stallman of Saratoga, CA. My default is to always stop when cars are around (or if I can’t tell if cars are around). If I’m certain a intersection is clear in a low traffic area, I will slow down and roll through at < 10 MPhil. A big part of the problem in my view is that stop signs are overused for the purpose of speed control and bicyclists are being penalized for car drivers bad behavior. I suggest looking into an article "Distracting Miss Daisy" that was published several years ago in the Atlantic. The author laments the frustration of dealing with many counterintuitive laws that have ltitle to do with safety. Lastly, while I can hardly condone loutish behavior on bicycles, I don't believe they s/b subject to the same fines and penalties as automobiles-the menace simply isn'the the same. With regard to the Wikipedia entry on “Idaho stop” it looks like it was written by someone who uses “Volcycle” for an ID and this person claims to be: A rocket scientist based in Washington, DC, USA. I wish people would use their real names for such matters. Keep in mind that STOP signs are rarely used in the Netherlands in the first place. They rely on signals, roundabouts, or yielding using simple right-of-way guidance and yield triangles on the roadway. As opposed to the US who overuses STOPs. Can’t run a STOP sign if it isn’t there in the first place!